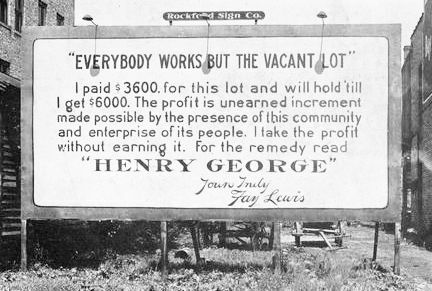 Use it or sell it: Rates and land tax, if sufficiently high, make it uneconomic for speculators to hold idle land. Thus land becomes more affordable for genuine users, who no longer have to compete with speculators. Bryan Kavanagh marks the 220th anniversary of a notable letter. Nothing has changed. Two hundred and twenty years later, as Australia wrestles with impossibly soaring house prices, there remains inaction on this most fundamental point. The one thing that politicians have ruled out of the debate is the only thing that can keep the lid on escalating land values: increased levels of rates and land taxes. It is too cynical to believe that Australia's politicians themselves, being landowners, don't want rates and land taxes increased. A more reasonable explanation is that they believe supporting higher rates and land taxes won't impress their voters — particularly those with highly-valued properties not acquainted with the fact that all taxes come home to roost against land values anyway — and that opponents of the idea will resort to the politics of scare, rather than of education. However, if the increases were made revenue-neutral, and payroll taxes and stamp duties abolished, perhaps along with the GST, the case could be more easily made. All the more so if payment of rates and land taxes were allowed to be deducted in regular installments from incomes if companies or individuals chose the option. Unfortunately, the suggestions that came out of the Labor Party's housing affordability summit in Canberra on 26 July 2007, and from Aussie Home Loans' John Symond more recently, amount to quite ineffectual palliatives which do not solve the problem of access to housing for all Australians, current and future.